‘You should be dancing, yeah…’ Against the pulsing primary colours of the backlit dance floor, John Travolta, aka Tony Manero, is showing us his moves on a screen as it plays the iconic dance scene from the Saturday Night Fever movie. Eyes distracted by his writhing hips in contour hugging polyester flares; ears alert to the driving, ‘four to the floor’ bass line, Barry Gibb’s piercing falsetto and that unforgettable Wah-pedal-heavy guitar riff. Hardly anyone is looking at the decor. Cast your mind back over your most memorable clubbing experiences and it probably isn’t the design that dominates. 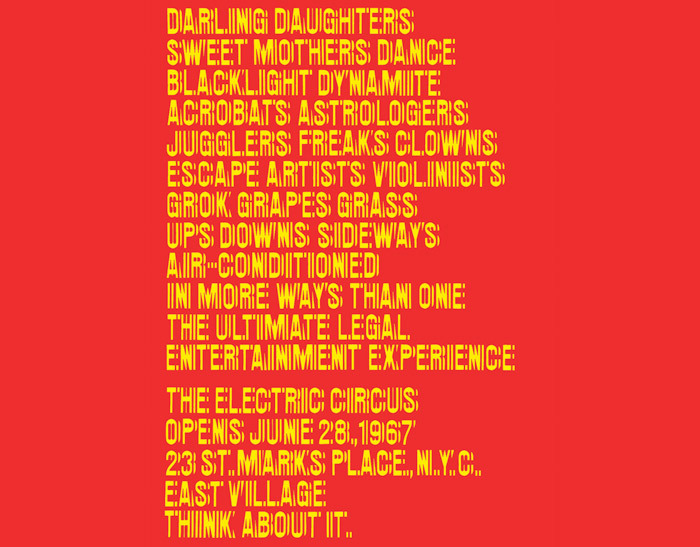 And yet the architecture, styling and atmosphere of particular nightclubs have exerted a major visual and cultural influence, fuelled pop culture and propelled an immersive physical/spatial/sensory phenomenon that didn’t exist before the Sixties into a mainstream, everyday (or weekend) cultural experience. However, a lack of objects — physical artefacts of any sort — from these ephemeral spaces is perhaps one of the reasons most museums shy away from this subject. So hats off to the team of curators — Jochen Eisenbrand, Catharine Rossi and Katarina Serel — for pulling together what they could (from 50 different collectors and only three institutions) to create this absorbing and uplifting exhibition, even if there is a fundamental disconnect in creating a mostly contemplative and cerebral experience out of a fundamentally noisy, immersive and visceral environment. Something gets lost in translation, but it’s not for want of trying. Designer Konstantin Grcic delivers the experience in four decisive, roughly chronological, slices. 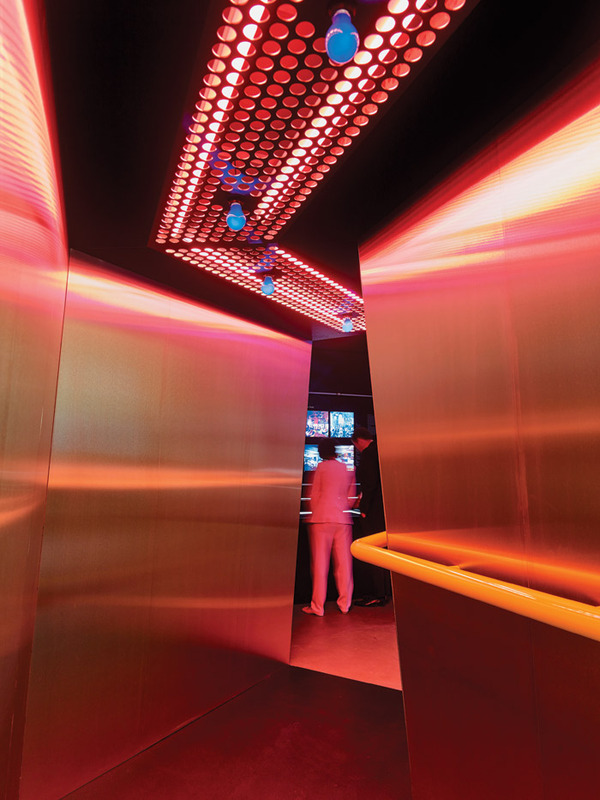 A gleaming, gold-panelled, top-lit passageway inspired by Superstudio’s Mach 2 club entrance in Florence, leads us into the black-walled first gallery, titled Beginning to see the light (each area is flagged up by an appropriate song title). 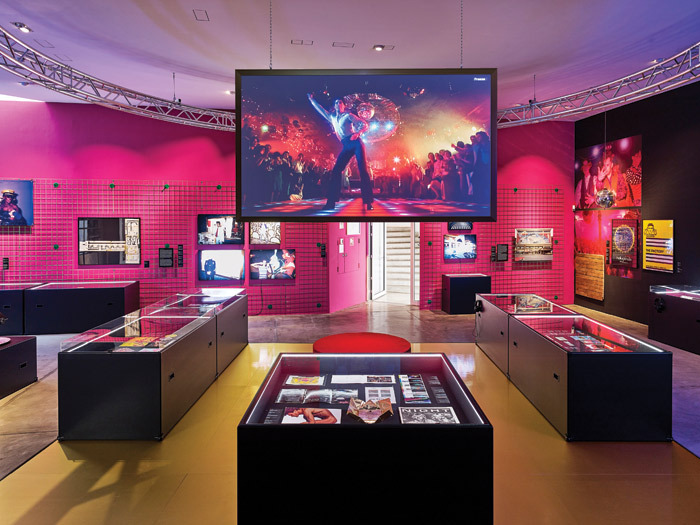 We are in the Sixties where Italy’s Radical Design movement, including architects Ettore Sottsass and Ugo La Pietro, Superstudio and Gruppo Strum, experimented with playful, space-inspired settings for socialising and dancing. There are colourful posters and photos of Giorgio Ceretti, Pietro Derossi and Riccardo Rosso’s L’Altro Mondo club (1967) in Rimini, Piper (1965) in Rome, and Gruppo 999’s Space Electronic (1969) in Florence. Influential ideas such as Cedric Price and Joan Littlewood’s Fun Palace proposal are referenced, and there are images of Archigram’s Monte Carlo casino complex (1969–72) and François Dallegret’s Palais Metro Montreal shopping centre, both of which featured nightclubs. Relying largely on posters, magazine articles, photographs and plans, the only three-dimensional items in the room are a handful of quirky Sixties’ club chairs, plus the introduction of scaffolding and rigging, which Grcic uses in some form or other throughout the spaces, as an improvisatory and industrial element of early nightclub architecture that has carried through to the present day. Grcic has also designed black, free-standing horizontal display units, their rims outlined in LED strips, which add depth, choreography and structure to the galleries. An area of blue carpeting in the room beyond takes us into the bizarre, cultish world of New York’s all-white Cerebrum (1968) club designed by John Storyk, where guests were asked to strip off, don white overalls and allow the music, projections and light show (and quite possibly some LSD) to alter their perceptions. A huge, blurry, blue, purple and pink photo of the club’s white-garbed inhabitants glows against a light box on the back wall, attempting to simulate the resulting disorientation. 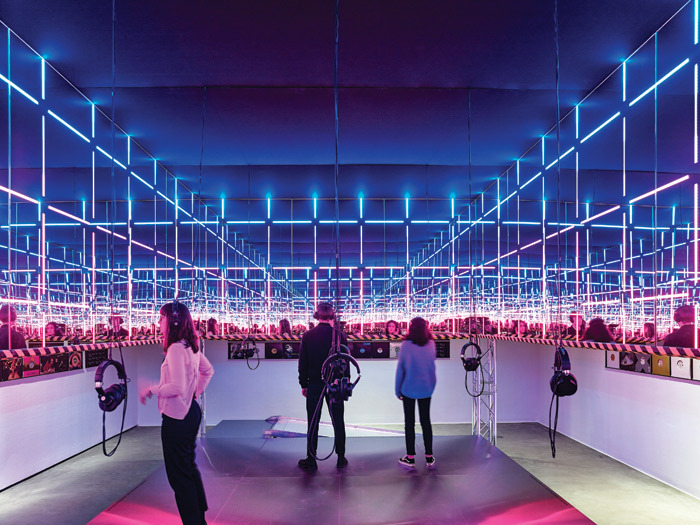 As if to try to compensate for the lack of actual sensory immersion, the second gallery — titled Can You Feel it — offers us a large, mirror-tiled dance cubicle of our own, devised by Grcic and lighting designer Matthias Singer. Headphones dangle on wires over this raised platform, allowing you to experience four playlists — ‘pre-disco’, ‘disco’, ‘house’ and ‘techno’ — enhanced by a flashing rainbow display of light patterns. The aforementioned soundtrack and swirling hips of Tony Manero usher us, via an overhanging screen, into the third gallery, complete with gold dance floor, which represents club culture’s commercialisation through the Seventies and Eighties. Titled Slaves to the Rhythm, that anthem’s singer, Grace Jones, is seen at New York’s Studio 54, next to a wall-sized landscape shot of its customary crowd of artists, actors, musicians and exhibitionists, while a series of mannequins wait on the red carpet, draped in Halston club couture. Design and fashion were a key part of the performative mix. 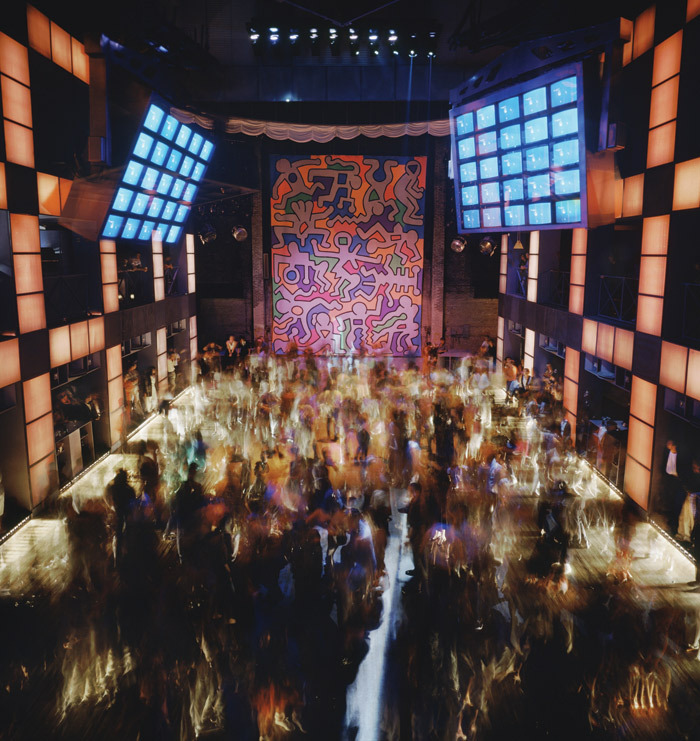 Another New York club, Area, apparently changed its interiors every six weeks, while Palladium brought in artists like Basquiat and Keith Haring to jazz up their walls. The Eighties’ shift away from the frilly and flamboyant is demonstrated by Ben Kelly’s definitive industrial aesthetic for Mancunian music mecca The Haçienda, whose fans were so devoted they did actually buy pieces of floor and a glitterball — both shown here — when it closed. The emergence of empty warehouses as prime spots for clubbing (and from which the term ‘house’ music was coined) was an egalitarian antidote to the superclubs’ exclusivity. The final gallery gives us a taste of what is happening now — named after the Daft Punk song Around the World. Nightclubs are disappearing, for several reasons: the rise of online music streaming; dilapidated city centre warehouses and basements being snapped up by developers; and the triumph of dating apps over clubs as a cheaper and more reliable means of hooking up. But some of the big brands are differentiating: there is a model and plans from OMA for its client Ministry of Sound’s new gym initiative, Ministry does Fitness. And the internet has carved out new audiences: the latest phenomenon, The Boilerhouse, is an open-air clubbing spectacle that shifts from location to location and is live-streamed all over the world.